To Cite: Pazouki A, Jangjoo A, Ali Pakaneh M. Intraluminal Clot Formation Causing Obstruction After Laparoscopic Roux-en-Y Gastric Bypass, J Minim Invasive Surg Sci. 2014 ; 3(1):e8471. Abstract: Bowel obstruction is a known complication after bariatric surgery especially Roux-en-Y gastric bypass. The known etiologies include internal hernia, jejunojejunostomy stricture, ileus, intussusceptions, superior mesenteric artery syndrome, incarcerated port site hernia, and adhesions. Blood clot is a rare cause of small intestinal obstruction after laparoscopic Roux-en-Y gastric bypass surgery. We elucidate a rare case of small bowel obstruction after Roux-en-Y gastric bypass due to blood clot in about 90 cm distant from ileocecal valve. By increasing the rate of laparoscopic Roux-en-Y gastric bypass surgeries, laparoscopic surgeons may be more frequently faced with the complications of this procedure. One of these complications is gastric outlet and bowel obstruction (1). It usually is presented with epigastric colicky abdominal pain, vomiting and obstipation (1, 2). 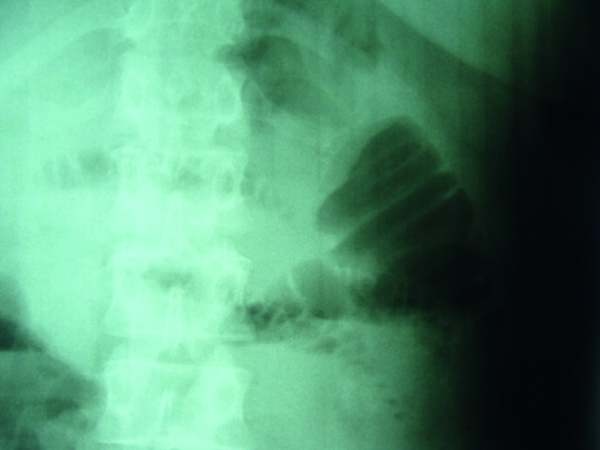 In this situation, bowel obstruction should be considered in differential diagnosis. The etiologies of bowel obstruction are adhesions, internal hernia, incarcerated port site hernia, stenosis of anastomosis, intussusceptions, superior mesenteric artery syndrome and rarely clot formation in the distal of small intestine (3-5). It may be complicated with disruption of the anastomotic staple line and consequently peritonitis (6, 7). We described one case of small bowel obstruction after laparoscopic Roux-en-Y gastric bypass surgery due to a blood clot. A 45 year old woman with a body mass index of 43 kg/m2 and no comorbidities underwent laparoscopic antecolic antegastric Roux-en-Y gastric bypass. To prevent deep vein thrombosis (DVT), the elastic compression stockings along with unfractionated heparin (5000 units, subcutaneously, TID) was used. The gastric pouch was made using 3 60 mm blue cartridges. The gastrojejunostomy was performed with one 45 mm blue endo linear stapler. A jejunojejunostomy was then created with a 60 mm white endo linear stapler. The operation was uncomplicated. The day after surgery, the patient underwent an upper gastrointestinal contrast (gastrografin) study for detecting staple line leakage (Figure 1). A few hours later, she complained of colicky abdominal pain, associated with distention and vomiting. After passing some watery stools, she became obstipated. 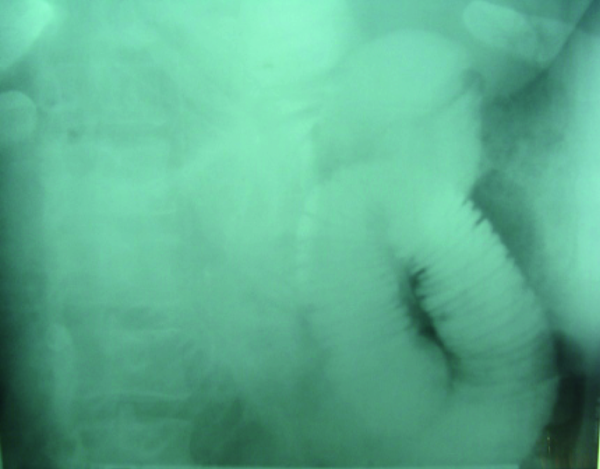 Plain abdominal X-rays showed distended small bowel loops (Figure 2). On the fourth postoperative day, the patient underwent an exploratory laparoscopy which revealed distended loops of the small bowel. No abnormal secretions were found in the abdominal cavity. All anastomoses were intact. The mesenteric defects were also intact. On exploration of the small bowel in a retrograde fashion, starting from ileocecal area, a transition zone, dilated proximal bowel loop with a firm intraluminal mass about 90 cm distant from ileocecal valve was detected. Using a bowel grasper, the mass was grasped, disrupted and finally pushed distally. The postoperative course was uneventful. The patient became asymptomatic and her defecation returned to normal. On examination of the collected stool specimens, some pieces of a relatively firm clot were detected which confirmed a blood clot by pathology. The next day, oral liquids were initiated and the patient was discharged home with no apparent sequelae. Blood clot is an unusual event as the etiology of small bowel obstruction after antecolic antegastric Roux-en-Y gastric bypass (5). The pouch construction and gastrojejunostomy are usually performed using respectively 45 blue and 60 blue endo linear staplers, and a 60 white endo linear stapler for jejunojejunostomy. Intraoperative staple line bleeding is a frequently detected event which sometimes could be continued and may require an intervention. Preoperative administration of heparin may aggravate bleeding (5). In patients with obvious external bleeding energy devices, sutures or clips are often used for hemostasis. Bleeding from the gastrojejunostomy or jejunojejunostomy staple lines is not usually visible (5). The present case typically became symptomatic after gastrografin study. It is supposed that hyperperistalsis which may occur following this procedure can lead to the accumulation and compression of intraluminal blood and consequently, formation of a firm to hard clot. In a series of 825 laparoscopic Roux-en-Y gastric bypasses, five cases of bezoar obstruction were detected (5). Two other publications reported 1% of bezoar obstruction in 796 (1) and 115 (8) cases of laparoscopic Roux-en-Y gastric bypass. The symptoms for mechanical obstruction of the small bowel include colicky abdominal pain, vomiting and obstipation. Additional symptoms comprise of fever, abdominal tenderness and leukocytosis which are detected in cases of closed loop obstruction and gangrene. Bezoar obstruction and other etiologies of obstruction such as internal hernia, kinking of the bowel at jejunojejunostomy and port sit incarcerated hernia predispose to closed loop obstruction (9). Quick diagnosis and treatment are essential. Upper gastrointestinal (GI) series and computed tomography (CT) scan are the best diagnostic modalities for detecting intraluminal clots (8-10). Although clinical signs are very indicative of closed loop obstruction, CT scan is considered as an important tool for detecting closed loop obstruction (5). Early postoperative obstruction caused by postoperative adhesions is not common in laparoscopic surgery. Nasogastric tube insertion will only decompress the alimentary limb not the biliopancreatic limb. Then, conservative management hasn’t any role on the management of small bowel obstruction especially complete obstruction. Early surgical intervention is advocated by many authors (8-10). According to Awais et al., the blood clot can be evacuated through enterotomy and the anastomosis is revised (8). If there is an obstructing bezoar in the stomach, it can be removed with endoscopic techniques (4). In the presence of postoperative small bowel obstruction, an obstructive blood clot should be considered in differential diagnosis. As any other causes of postoperative obstruction, it should be treated immediately to prevent its potentially lethal complications. For prevention of blood clot formation, the best way is to avoid stapler line bleeding, but in the event of bleeding, appropriate hemostasis should be ensured. However, the benefits of heparin administration for preventing DVT and pulmonary emboli remain undeniable prior to blood bezoar. We gratefully acknowledge Ms. M. Hassanpour for editing the manuscript. Implication for health policy/practice/research/medical education: Since adhesion is a rare event as the etiology of bowel obstruction after laparoscopic surgery, surgical interventions are usually regarded for the management of this complication. In the presence of postoperative small bowel obstruction, an obstructive clot should be considered in differential diagnosis. Computed tomography scanning or upper gastrointestinal study could be applied for detection of the small bowel bezoar. Authors’ Contribution: Study concept and design: Abdolreza Pazouki, Ali Jangjoo, and Mohammad Ali Pakaneh. Analysis and interpretation of data: Ali Jangjoo. Drafting the manuscript: Ali Jangjoo. Critical revision of the manuscript for important intellectual content: Abdolreza Pazouki, Ali Jangjoo, and Mohammad Ali Pakaneh.